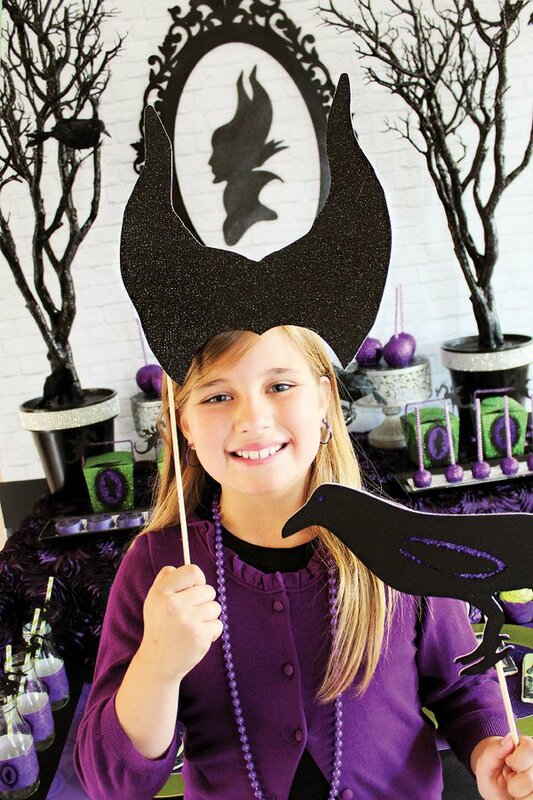 Have you all seen the trailer for the new Disney movie, Maleficent? I’m so excited to see the movie, Angelina looks like the perfect villain! 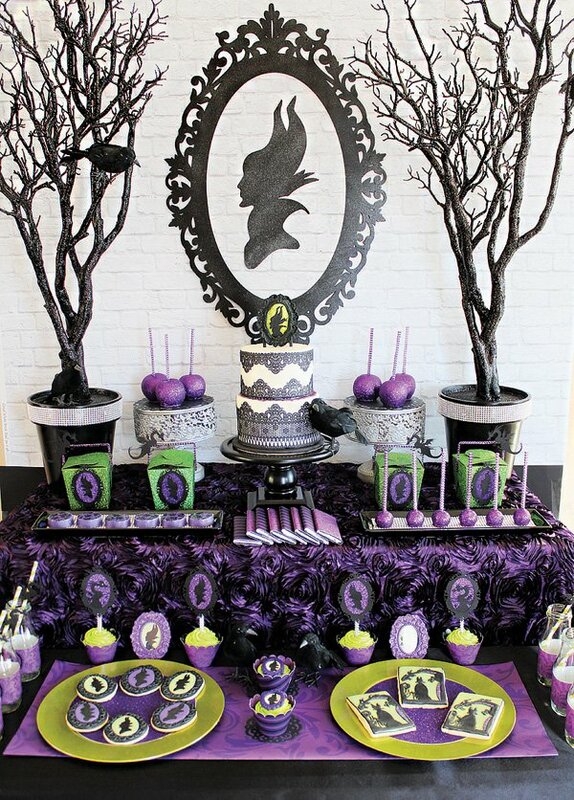 In anticipation of the film, which comes out in the US on May 30th, Michelle Stewart of Michelle’s Party Plan-It (who has always loved this particular villain) styled this amazing Maleficent Inspired Dessert Table! 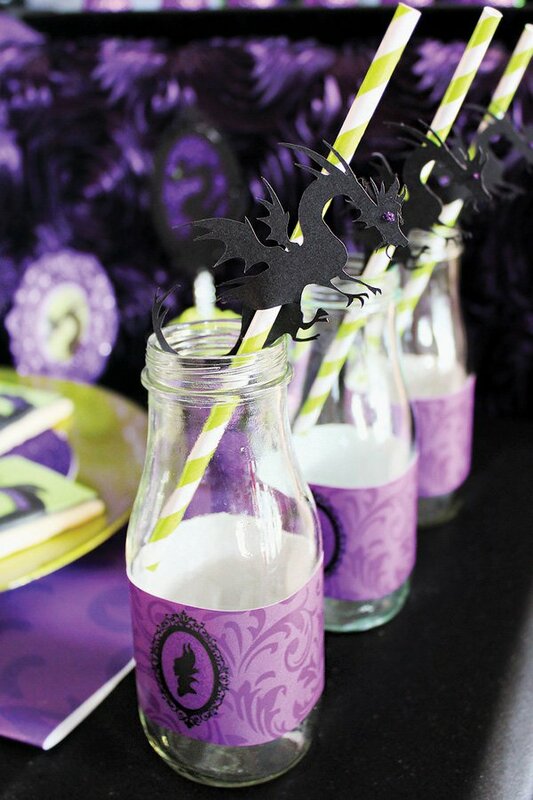 I love the purple, green and black color palette, which gives the perfect creepy vibe and would also work super well for a Halloween party! 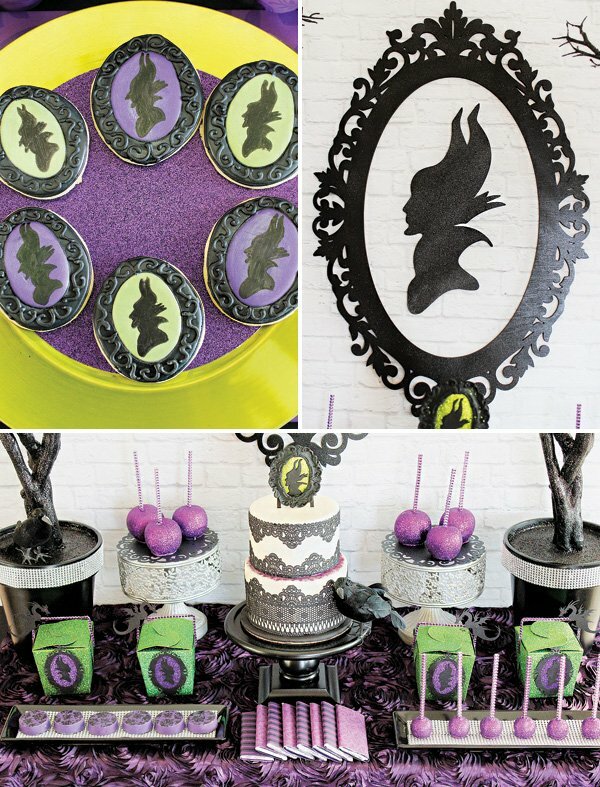 Disney’s Maleficent is my all-time favorite Villain and in honor of the new movie premiering on May 30th, I collaborated with several amazingly talented party ladies to create a Maleficent inspired dessert table. 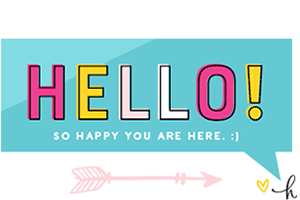 I searched and searched for the perfect graphic to use for my stationery, finally I came across a beautiful hand cut silhouette made by Isabel Talsma. With Isabel’s permission, I used her artwork for the party stationery and Lauren of Ten23 Designs created the beautiful silhouette and frame for my backdrop. 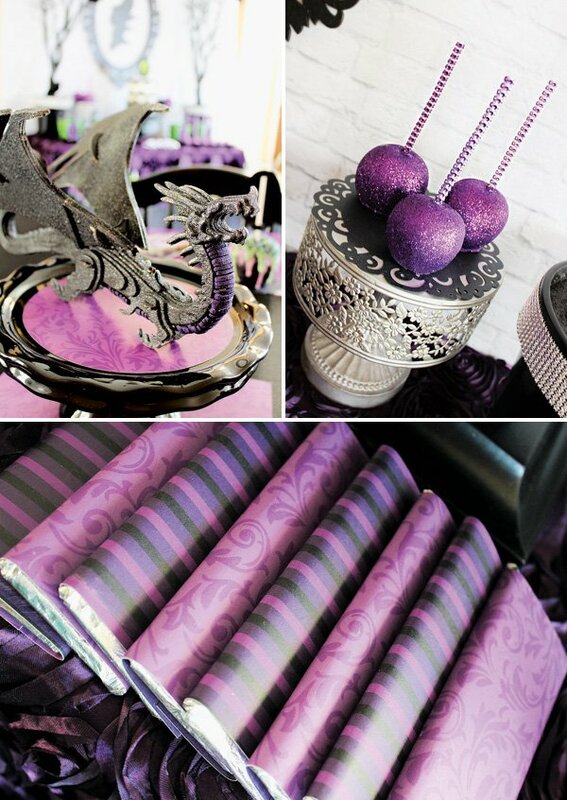 To set the stage, I dug out my spooky glitter trees and crows from my Halloween decoration stash and made a table cloth out of purple rosette fabric. 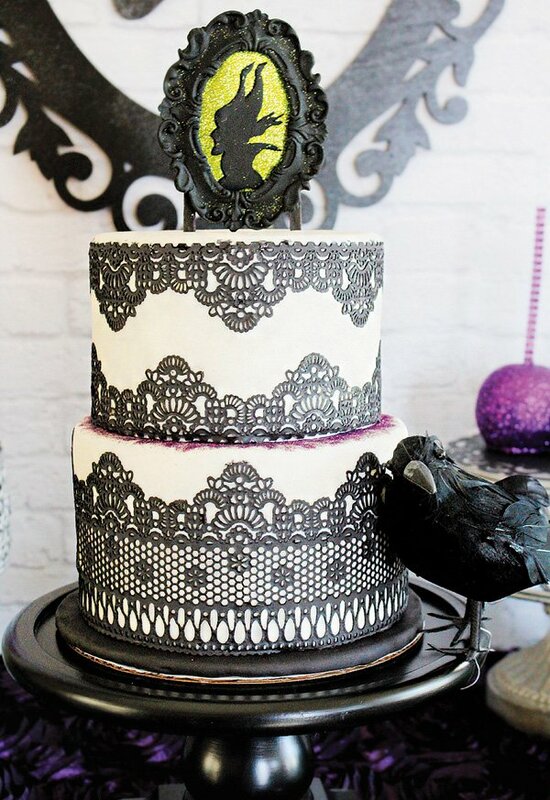 Roxane of Fancy Cakes sent me the beautifully detailed lace fondant cake with matching topper. Pictures truly don’t capture it’s beauty. It is stunning in person! 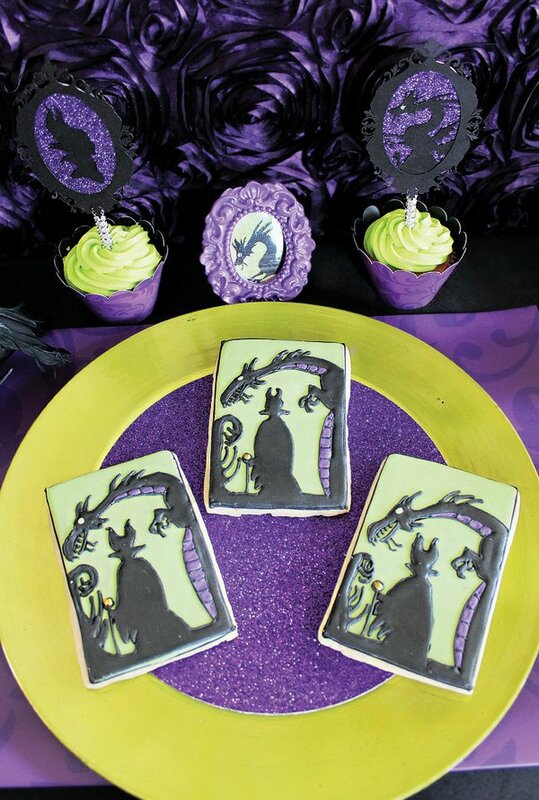 The ever so talented Katherine of Creating Awesomenessity sent a big batch of cookies, including the hand-painted silhouette cookies and my personal favorite, the Maleficent/Dragon scene. 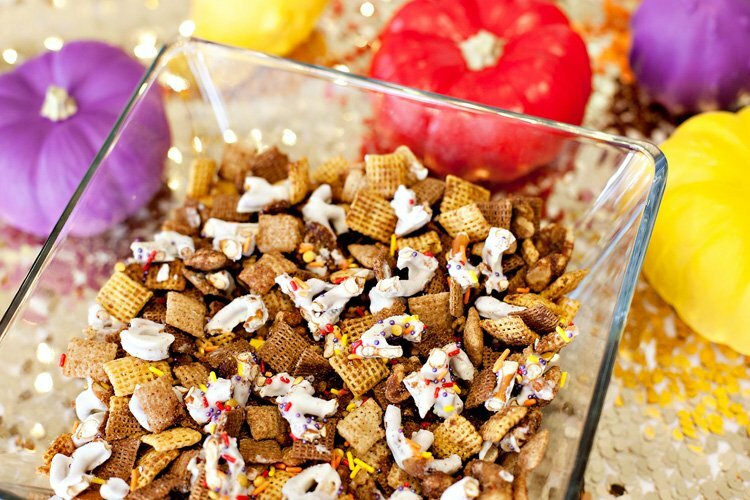 Autumn of Autumn Lynn’s Chocolate Sins made glittery candy apples and cake balls on glitzy sticks sent from Painting Paris Pink brought the perfect amount of glitz to the table. 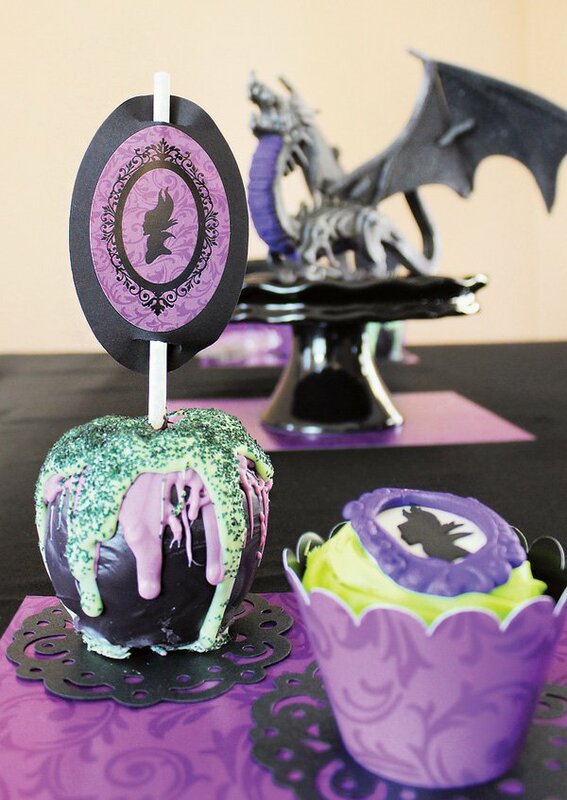 The damask chocolate covered Oreos added just the right amount of elegance. 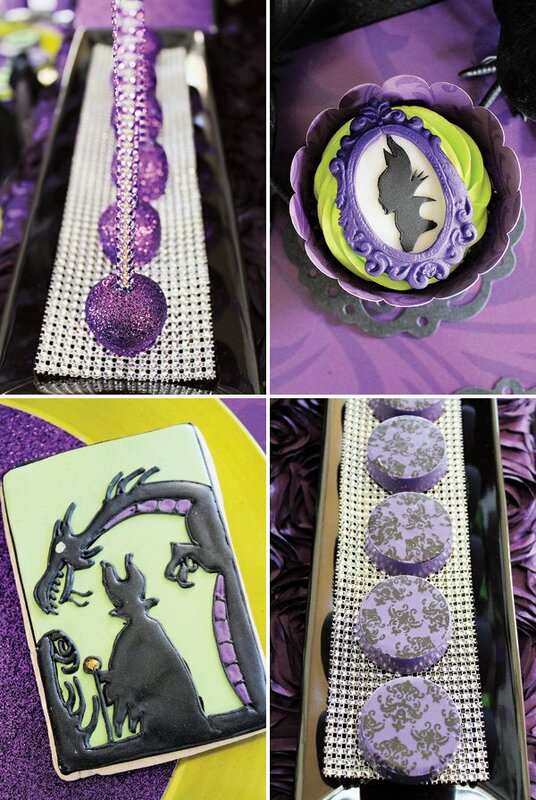 Hakima of Kima’s Konfections created the gorgeous and perfectly matched fondant cupcake toppers. 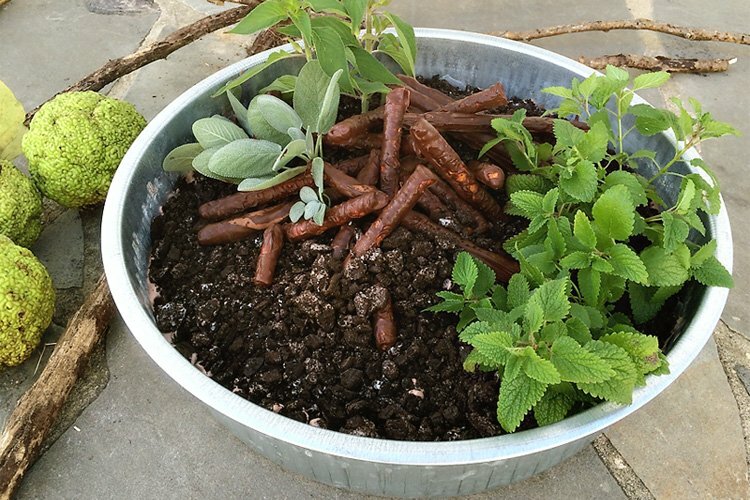 My friend, Jamie, made delicious multi-layered candy apples and candy dipped pretzels for the kiddie table. My boys and I built and painted the dragon wooden puzzle I found at Michaels for the table centerpiece. 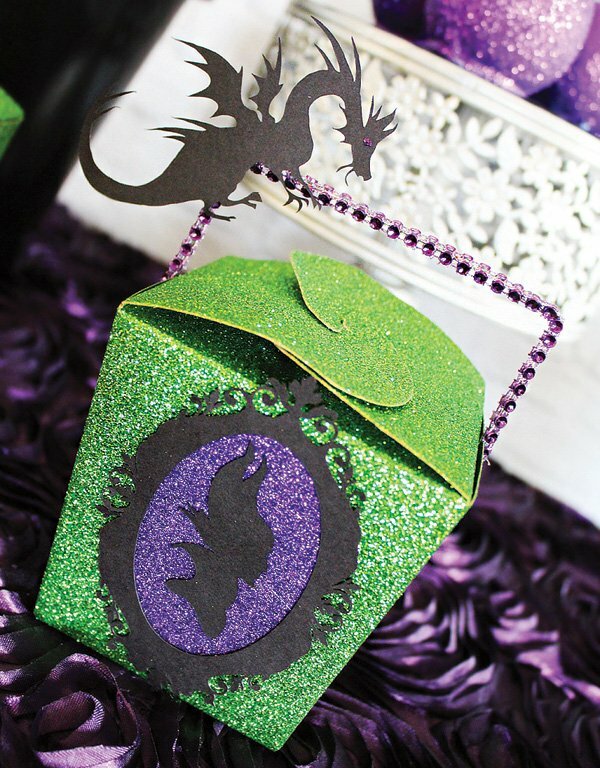 Using my Cricut Explore, I made the cupcake toppers, favor box embellishments, straw toppers, photo props and cupcake wrappers. It was a pleasure to collaborate with such a wonderfully talented and generous group of ladies! Ooooooo! I love this. 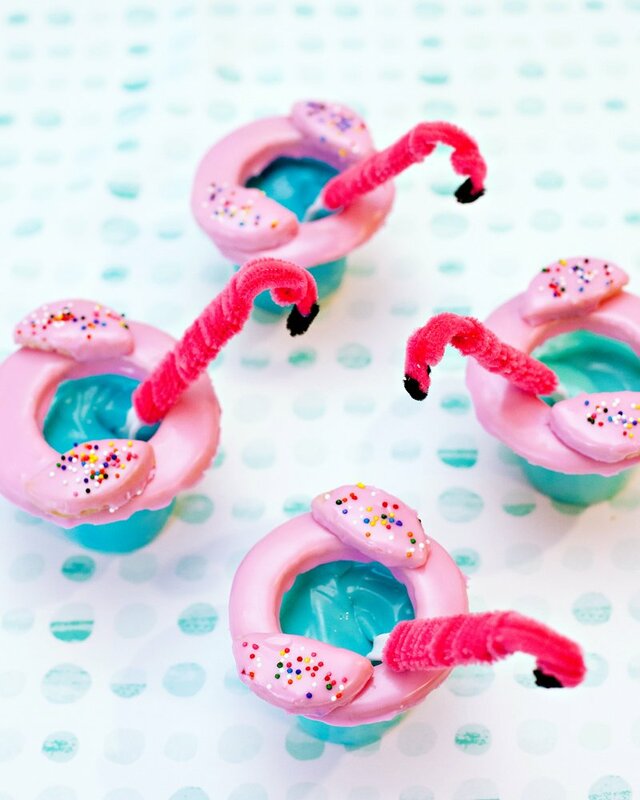 This is the party I want for my birthday (in June). 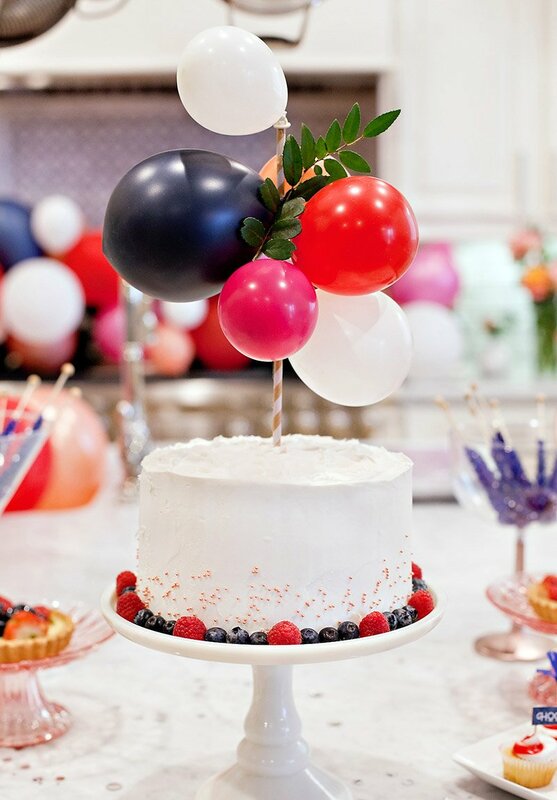 For anyone interested…This is a party I would love for my birthday! 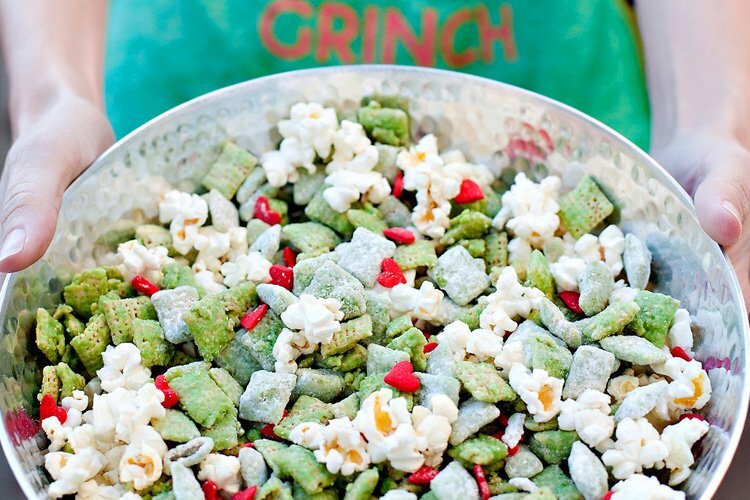 It's in June, you know. Hint…hint…David and Mom. Why sure honey – I'll get right on that!